So you would have seen an increase in the appearance of Batiste hair products in recent months as I have just been loving them. I haven't used any other styling products so thought I would tell you a bit more about these. 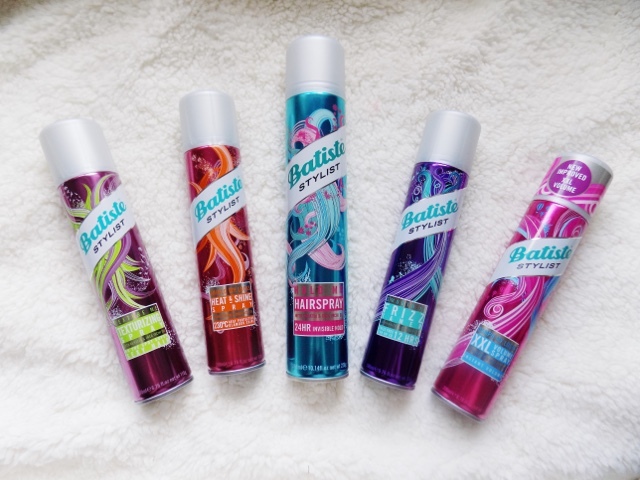 First off is the main attraction, the new-ish Batiste Stylist range and my favourite of the bunch? The Oomph My Locks XXL Volumising Spray which does exactly what it says. You have to be extra careful as it leaves a white cast so short sprays from a good distance will prevent these. I spray in sections at the roots of my hair and then use my fingertips to rub the product into my scalp and the volume is instant and incredible. It's backcomb in a bottle. For extra texture for that tousled beachy waves, perfect for summer, the Texture Me Texturising Spray is what I would reach for. It boosts texture whilst still allowing movement and gives that super effortless, un-done look to your locks. This is great for an up do or a top knot to give some extra grit to your hair so it stays where you want it. Something that I think should have a lot more of a following is the Shield My Locks Heat & Shine Spray. This protects hair from heat up to 230 degrees, and is for use on dry hair, not wet. It's a 2 in 1 product, heat protector and shine spray so it gives instant shine, moisturises and conditions with the infusion of Inca Inchi Oil and Keratin. The Smooth It Frizz Tamer is a humidity resistant, frizz-free styling product which gives smoother, softer locks with up to 12 hours whatever the weather. This is great for smoothing down those fly aways and it still has the Keratin and Inca Inchi Oil so it conditions and moisturises your hair. Another good one for an up do as you can make sure there's no strays and that your hair looks frizz-free. The Hold Me Hairspray is a lightweight, non sticky or crispy formula, which weatherproofs your hair, whilst still being easy to brush out. What's great is these all come in at around the £4.29 and I have also been loving the Tropical Dry Shampoo which is just £2.99, I really like there Dry Shampoo for Medium Brown hair too. Tip: You have to be careful with all of these products not to apply too much as it can make your hair feel super heavy and sticky and make sure you use a good clarifying shampoo every week or 10 days just to get rid of product build up as these do leave a residue. I wanted to give you a super quick run down on all of these products, why I love them and how I've been using them. I've been using them for months and I am no where near done on any of them and I use them every single day. 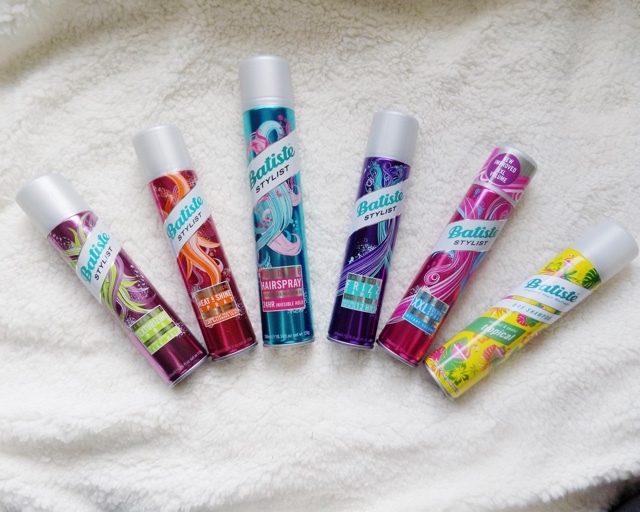 Have you tried any of the Stylist range from Batiste?